One of the troubles with trying to get your meat-eater friends to try vegetarian food is that it does in fact taste like vegetarian food. While there is nothing wrong with a beautiful blend of vegetables, herbs and spices, for those who have raised on a meat infused diet the incentive to try new foods is often hard to come by. That is where Enlightened Cuisine comes in. Here you'll find a Chinese restaurant that provides vegetarian food with an alternative: mock meat. Some may be sceptical to try the 100% vegetarian 'meats' but rest assured, one bite of the golden duck slices or crispy salted chicken and you'll be hooked. 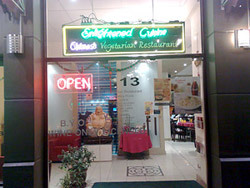 Located near Crown Casino at 113 Queensbridge Street, Southbank, this gem of a restaurant will defy all your preconceived about mock meats and vegetarian food. Now under new management, the service at Enlightened Cuisine has dramatically improved as have the prices. Main meals average between $15-$25 with 6 duck slices for just $5. Do check it out, you won't regret it.